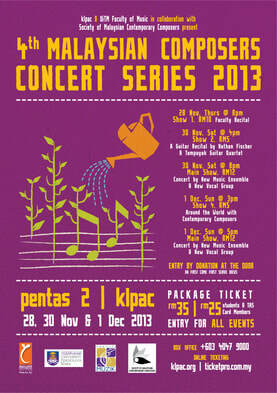 The UiTM Faculty of Music and klpac proudly presents the 4th Composers Concert Series 2013, in collaboration with the Society of Contemporary Malaysian Composers. The concert features students of New Music Ensemble, Voices and special guests performing almost 40 new contemporary compositions by students and other composers. New works by Elvin Dainal, Catriona Au, Nor Affendi Mazalan, Caeleb Tee, Abg Mustaqim, Rayner Naili, Nurulain, Zulaikha, Faraz Ernamdoust, Gloson Teh, Scarlet Gouk, Wan Azlan, Siti Zata, Mohd Hakim and Faculty members Tazul Tajuddin, Nathan Fischer, Ross Carey, Katia Tiutiunnik. UiTM Contemporary Chamber Ensemble led by Yeoh Pei Ann (lecturer), music students, and conductor Prof Madya Dr Tazul Tajuddin. Promo: Package @ RM35 for adult / RM25 for students, TAS card member and Disable **This package will enable you to enter all the events listed above.